What is Fiber Cement Siding Made of? How Much Siding Do I Need? When it is time to choose new siding for your house, there are quite a few variables to consider. You want a siding that will look great, of course, but it also needs to be affordable. You want a durable product that requires as little maintenance as possible. Unfortunately, there is no one siding that meets all of these requirements. Wood, cedar, stone or brick, vinyl siding, metal siding, and stucco all meet two or three of the requirements. 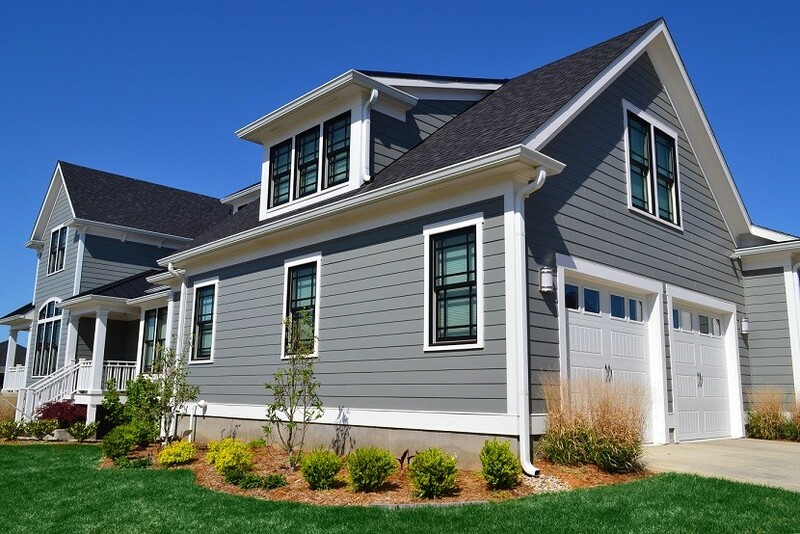 There is one type of siding, however, that meets four of your requirements – fiber cement. This product is made of Portland cement, wood fiber, clay and sand. 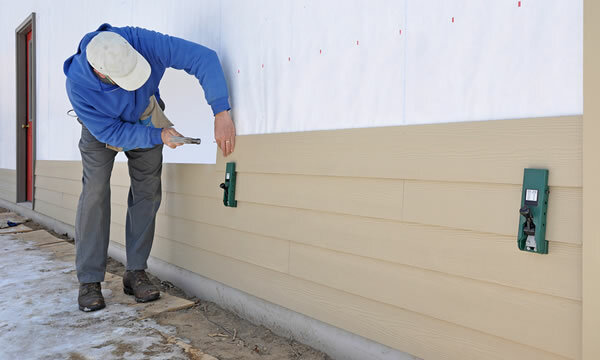 The mixture produces a tough, durable siding that can be molded into different textures and profiles to imitate clapboard siding, brick, or shingles. Since the main ingredient is cement, this product performs as well as masonry does, with about the same upkeep. It is rot and fire resistant and termite-proof, as well. Extremes of temperature do not warp or crack fiber cement planks. In fact, about 15% of new home construction in the U.S. uses fiber cement. It costs a fraction of what cedar siding does. Portland cement: Cement binds all of the materials together to create a slurry that hardens into a durable, masonry-like product. Manufacturers use scrap wood fibers and pulp from lumber and paper mills, so they are basically recycling the waste from other industries. The wood pulp is mixed with cement and water. Sand, fly ash, or clay is added to add form and bulk to the slurry. Then, the mixture is pressed into molds that form planks. The molds often have a texture that will be pressed into the surface of the plank, creating a faux-wood grain look. The molds are then dried under extreme pressure. The result is a board that is durable in all weather. Break one of the planks, and wood fibers are visible. Different manufacturers offer different warranties. The warranties range from 25 and 50 years to a lifetime. You can order pre-finished or pre-painted, which will have a 15-year warranty against fading and bubbling. In some cases, the homeowner can transfer the warranty to new owners. Once installed, it is low maintenance. Mostly, you will need to spray it down with a water hose or power sprayer once a year. Make sure the seams and joints are still caulked and protect the siding from landscaping. Allowing foundation plants to rest on the siding can hold moisture in that will create a mold problem with any siding. While the planks can be ordered pre-painted, they will have to be repainted every few years. You can have a fieldstone look on your house with a fraction of the cost of real fieldstone. The planks are embossed under high pressure during the drying process. These textures can be wood grain, stone, or masonry patterns. You can also order planks with no texture for a sleek, modern look. There are many color choices available and you can paint it whenever you’d like. The pre-painted planks have a 15-year warranty on the color. Since this is cement, it does not expand and contract the way wood, vinyl, and metal do, so the paint and caulk usually stay in good condition longer. Regardless of the heat or humidity, fiber cement planks do not warp. They are crack-resistant, usually only cracking when they receive an extremely heavy impact, such as from a car or large tree trunk. Sub-freezing temperatures will not make this product brittle, and it is fire-resistant. It won’t swell up, warp, cup, or bow, and it can stand up to windstorms and hail. It will not rot, either. Most homeowners who live near the ocean have trouble with the salt air and humidity. However, fiber cement is not affected by the bright sunlight or salt conditions found on the beach. In addition, it can withstand winds of 130 mph if it has been installed correctly. For structures at high altitudes, it is not affected by UV rays. Fiber cement products, especially Hardieboard or HardiePlank, are made of sand and cement. These are not flammable products. They are categorized as neutral material, which means that these materials will not feed flames. There are even a few insurance companies that will offer homes in wildfire-prone areas of the U.S. a discount if they install fiber cement. Pests have no interest in any of the materials used to make fiber cement planks. While the planks have wood fiber in them, the fibers are full of cement, so carpenter ants and termites leave them alone. This is especially useful in the south, where humidity and year-round warmth create a perfect breeding ground for pests. This is a heavy material, weighing in at 2.5 pounds per square foot. Therefore, it takes more energy to transport and install the product, driving the cost up. It is not as flexible as other long planks of vinyl, metal, or cedar, and can crack if not properly supported. Because of this, siding contractors must have larger work crews. They have to be especially careful when installing the planks so that they won’t get cracked. It requires special tools for installation, so it is better to have professionals do the work. Due to the weight and possibility of damage to the planks during installation, fiber cement takes more planning. Siding contractors will need larger crews. HardiePlank weighs about 300 pounds per 100 square feet, while the same area of vinyl siding weighs about 70 pounds. Certain safety measures must be employed as well to keep workers from inhaling the dust when planks are cut. With the extra manpower, safety precautions, and specialized tools, the labor will be 50% more than you would pay for vinyl. 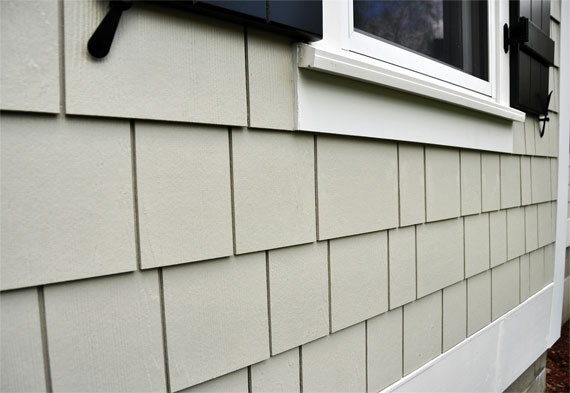 Fiber cement planks are an excellent choice for a durable, low-maintenance siding that looks nice. If beauty is your main goal, then you can’t beat cedar siding. If saving costs is your priority, then consider vinyl. Here are some other options to consider. Brick and stone are as resistant to insects, fire, and rot as cement. However, they are much heavier, and require the services of a skilled mason. Brick is manufactured, and stone is quarried. To have a mason install brick, you’ll pay about $5.25 for each square foot. For stone, expect to pay $9.50 for the same area. Vinyl is available in many styles and colors. It is lightweight enough that the homeowner can install it himself, with a little training. However, It doesn’t usually look as good as wood or fiber cement. It will require some maintenance, mostly cleaning with repairs now and then. Repairs are relatively easy. It is flexible enough to deflect hailstones, but as it ages loses some of that flexibility. It is used on the majority of houses in the U.S. because of the affordability and decent appearance. It costs $3 to $7 per sq. ft. installed. Another lightweight, affordable option is aluminum siding. It won’t warp in extreme heat like vinyl will, but it will dent. It requires occasional washing and eventually you will have to paint it. This siding is about $5 to $9 per sq. ft. installed. Found most often in hot, arid climates, stucco is another cement-based product. It requires a skilled craftsman to install the multiple layers, and costs about $9 to $12 per sq. ft. installed. Best For: The longest history of quality products. JHI, or James Hardie Industries, was the first to create fiber-cement siding. In the early 1900s, Hardie used asbestos instead of wood fiber, which naturally created problems. Later, the formula was re-created using wood fiber. Today, tradesmen and homeowners alike refer to all fiber-cement as HardiePlank or Hardieboard, whether it was made by JHI or not. JHI has focused all of its research, development, and manufacturing on fiber-cement boards. Most of the boards are 5/16” thick X 12” long. The individual planks can be ordered in a variety of widths between 5 ¼” and 8 ¼”. You can order planks, panels, or shingles in Hardieboard. The color is baked in, and if you want a color not offered by the manufacturer, you can paint it. 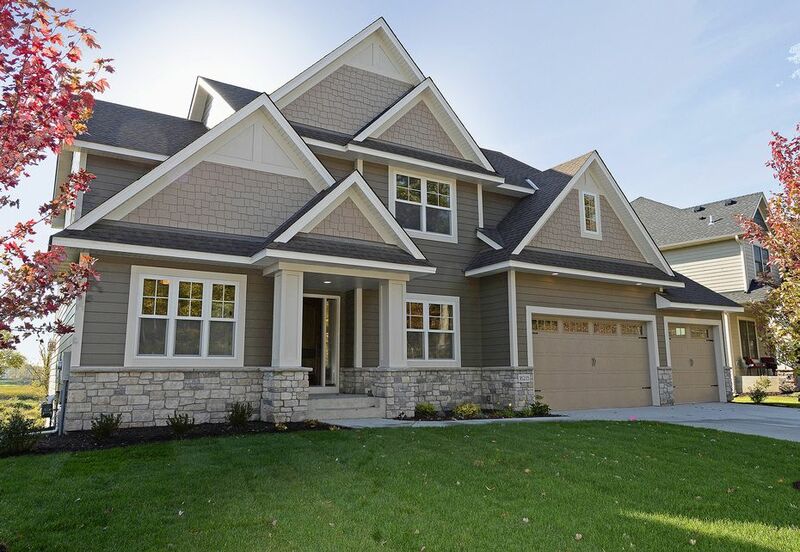 Lowe’s Home Improvement Center has chosen Hardieboard as its top fiber cement option. Pronounced Nee-chi-ha, this Japanese company provides fiber cement siding to such commercial giants as KFC, Sonic, and Burger King. You have probably seen Nichiha siding in your town, but not on your neighbor’s house. It is gradually branching into the residential market with its Vintage Wood line which imitates bark and cedar. The company headquarters is in the southeastern U.S.
MaxiTile is located in Houston, TX. 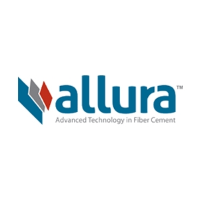 It is a small company that has decided to take on the big names in the fiber cement industry, including JHI. They hold to what they call The Code, which is a manifesto that stresses good relationships will all people involved in the business, from employees to vendors to customers. Their toe-hold in the industry, besides a good product, is customer service and satisfaction. CertainTeed is a well-known name in home improvement. They manufacture and distribute just about everything needed in the trade. This company is just the opposite of JHI in that it became somewhat over-diversified. It sold its fiber cement branch to a Mexican company called Elementia. Elementia produces the siding, now, under its Plycem USA company. Allura Plycem is another name for the company. They make smooth-textured panels that are used on modern commercial buildings and condos. They also make lap siding, vertical siding, and shingles. The Home Depot carries GAF fiber cement siding. Their brand is WeatherSide. The company only makes shingle-style products designed to be used in repairs of small areas. In some cases, they may be used when replacing asbestos cement siding. If you have a small addition or bay window, this would e a good product to use for siding. 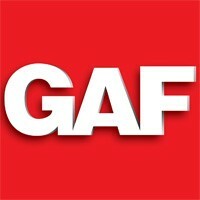 GAF is a roofing company for the most part, and it shows in the limited product they produce in the fiber cement market. This 100% American company is a good source for replacement of the old asbestos-cement shingles. There are many factors that go into determining whether or not a product is environmentally friendly. Fiber cement siding cannot be recycled, which would seem to be a mark against it. However, it is environmentally inert. That means that it does not degrade into substances that can damage the ecosystem. The ingredients are all natural, except when fly ash is used. A lot of energy is needed to produce the boards, because they are kiln-dried under great pressure. This requires a lot of energy to produce the heat. Since it is so heavy, it takes more energy to transport it. It also takes more workmen to install it, and care must be taken because the dust from cutting the product can cause lung infections when it is airborne. However, its durability means it does not have to be replaced as often as other forms of siding. This keeps it out of landfills. The manufacturer of fiber cement has a lot of impact on the environmental impact of production. CertainTeed, when it was making the product, only used wood fiber that was harvested from commercial forests. 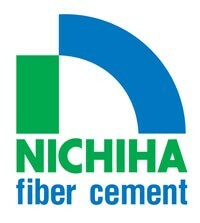 In addition, CertainTeed and Nichiha use fly ash in their product. Fly ash is the waste left over from coal combustion, so they are recycling waste material. Nichiha pursues best practices in their manufacturing processes. They recycle 100% of the scrap produced in manufacturing. They source material locally to cut down on shipping, which helps the environment. Their facilities recycle 95% of the water used in manufacturing. James Hardie is committed to eco-friendly practices. JHI locally sources 90% of its supplies. They recycle solid waste, use waste-minimization manufacturing techniques, and are committed to Zero to Landfill movements. JHI also does not use fly ash, because it believes the durability of their product is negatively affected by that product. Your calculations for siding will depend on the kind of siding you choose. You will include the square footage of your windows and doors in your calculations, because you will need “fudge” room. A siding contractor will use these waste pieces first when possible and often leave you with materials you can return for a refund. Measure the length and height of the wall to receive siding. Multiply the numbers together, and you get the square feet needed. If you are having shingles installed, you probably need for the contractor to do the calculations, because it gets rather complicated. This equation works on clapboard, panels, lap siding, and other styles besides shingles. This is a very heavy product. Because of this, you will need a minimum of 2 people to carry each strip. The strips must be supported in the middle to prevent torque or cracks. While it is very durable, it is relatively fragile before it’s installed and may crack or get chips in it. Even after the product is cut to length, one person will have to hold the section up while another person nails it in place. Cutting is usually done with an electric saw, and the worker must wear a respirator. As mentioned before, a respirator is necessary when cutting fiber cement boards from any manufacturer. The planks contain silica. Power saws shoot fine silica dust into the air, which can cause lung damage and eventually silicosis to people exposed to it for a long period of time. Irreversible damage may result. The layout of your siding will depend on the profile you selected. Some panels can just be butted together, which makes it easy to calculate the layout. That also makes for a bland profile. Clapboards, lap siding, and other shaped panels require a more careful layout. There is usually an overlap on these profiles. For instance, the overlap should be at least 1 ¼”. This actually reduces the amount of exposure for the panel. If you calculate based on 6 ¼” wide planks, you’ll run short of product. That’s because only 5” are exposed, due to the 1 ¼” overlap. No siding job is complete without trim. Without trim, moisture and insects can get behind the siding and destroy the structure. Trim can be PVC, fiber cement, or wood, and is usually ¾” or 1” thick. Trim should be installed on all corners and fascia. Leave a 1/8” gap between the trim and the siding planks, and caulk it closed. It can be ordered pre-colored. However, the installation process may require a touch-up. In some cases, the lumberyard will paint the siding before you pick it up. If not, you will need to paint it after installation. Paint it the same way would paint wood, with primer and a weatherproof paint. Boards painted at the manufacturer cost about $1 more per square foot. You get a 15-year warranty, but they only put one coat of paint on the product and there aren’t many choices. If you hire a paint shop to do the work, they will give it 2 coats and a 25-year warranty. You will also get a wider selection of colors. This will cost about $2 more per sq. ft. However you will also have to ship the siding to the paint shop and back again, which can get costly. If you have the siding painted on-site, you’ll get a couple of years on the warranty. It pays to have an experienced siding contractor install your siding. Each edge that is cut should have primer painted on it to seal it. Stainless-steel nails should be used to prevent rusting. Joints and trim should be caulked. Caulk should be an exterior-grade brand that remains flexible and can be painted. The planks should be installed no less than 2” above steps and porches to eliminate the risk of water absorption. It should be installed 6” above grade for the same reason. Part of regular maintenance of this product is to check the caulk and replace it as needed. Lapboard or clapboard siding is available in fiber cement materials. You can order smooth surfaces for modern homes, or request a rough-sawn or wood-grain surface. The planks are available in different widths ranging from 5 ¼” to 12”. They arrive primed or with paint applied at the factory. Clapboard styling works with a wide variety of architectural types and remains attractive regardless of the climate. 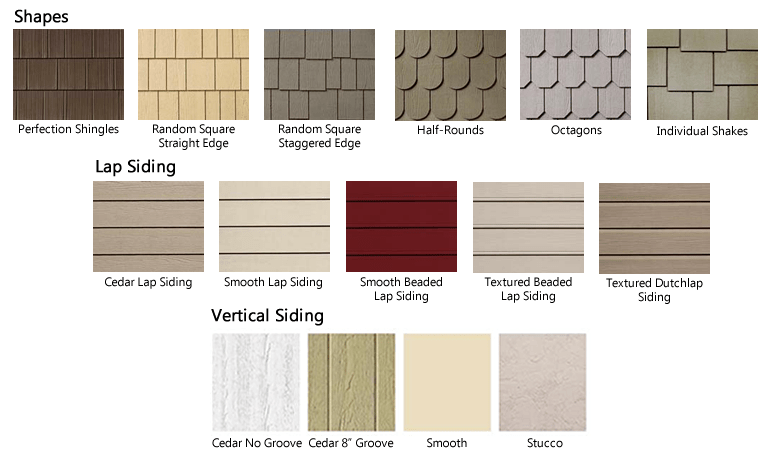 Shakes and shingles are available in strips or as individual shingles. The strips of shingles are available in 4’, 8’, and 12’ strips. These have either wood-grain or hand-hewn texture, and can be ordered primed, painted, or stained. You can replicate the look of stucco, brick, and stone, and you never have to worry about the mortar cracking. You will also be spared the expense of a mason. These masonry-patterned panels are available in two thicknesses of 5/6” or 5/8”. Panels are 18” X 6’ or 4’ X 12’. These panels interlock, continuing the stacked stone look and making the siding water-tight. 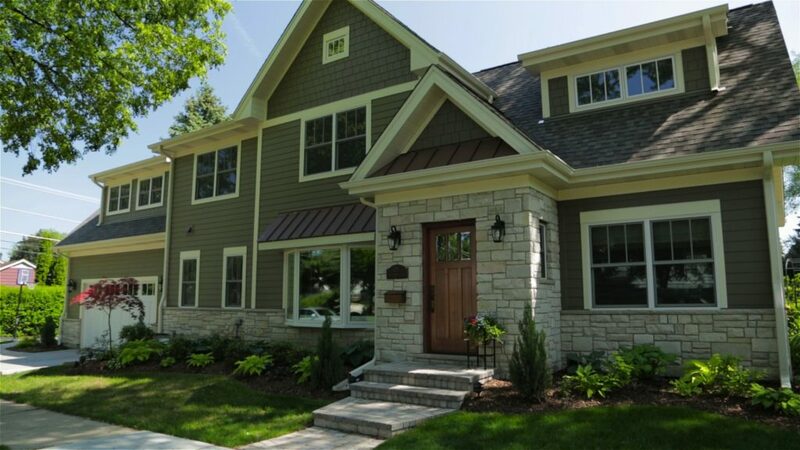 What do you think of fiber cement siding? Have you received a quote? Tell us about your experiences in the comment section.